In this post I’ll walk through an example using a company that delivers a CRM product called Customer Stalker. The company provides a library for Customer Stalker that includes a Code First model with some hooks to allow each business that uses Customer Stalker to customize the model. We’ll see how a company called MyBiz uses these hooks to extend the model. MyBiz will use inheritance to add extra properties to existing classes/tables that are part of the Customer Stalker model. 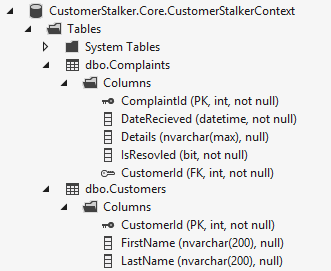 In Part 1 we’ll assume that Customer Stalker does *not* use Code First Migrations to create/upgrade the database and MyBiz will manually add their additional tables/columns to the database. In Part 2 we’ll enable migrations. The Code Before Enabling Customization – Before allowing any customization of the model, we’ll take a quick look at code from the Customer Stalker library and code written by MyBiz. Basic Extension – We’ll start with the very basics that allow MyBiz code to provide instances of a custom derived type to the Customer Stalker library. Substituting Custom Derived Types – Once MyBiz has added a derived type, they probably want the Customer Stalker library to always create their derived type, rather than the original base type. This means that all data in the database will have the custom properties – not just the instances created by MyBiz code. Avoiding Modification of the Core Tables – Next, we’ll look at how MyBiz can add their customizations in a way that does not alter the tables that are created by the Customer Stalker library. Customizing the Core Tables – Finally, we’ll show how MyBiz could customize tables/columns that are part of the core Customer Stalker model. Adding Code First Migrations – We’ll allow Customer Stalker to use migrations to create/upgrade the database. We’ll also provide some hooks so that MyBiz can add their own migrations to apply their customizations. Source Code Download – I’ll provide a Visual Studio solution that shows the complete Customer Stalker and MyBiz code bases. Before we add any hooks here is the model that the Customer Stalker library is using. They have a couple of domain classes to track Customers and any Complaints they make. Customer Stalker uses a derived DbContext to turn these classes in a Code First model. They are using the Fluent API to configure the model – in this case just the maximum length of the name properties. You may have noticed that that the context is internal. The Customer Stalker library exposes an API surface that restricts how businesses such as MyBiz interact with their library. Here is one of the services they expose. MyBiz is getting familiar with the Customer Stalker library and has written the following code to test it out. Here is what the Customer Stalker database would look like at MyBiz – this is the default Customer Stalker database with no customization. The Customer Stalker team is introducing a new ModelCustomizer class into their library. At the moment they just allow businesses to register some custom logic to further configure the Customer Stalker Code First model. They’ve also included an internal method to apply this customization to a model. They’ve also updated their context to apply any customization after they’ve finished configuring their model in the OnModelCreating method. Let’s see how MyBiz can use these extension points to store some extra information about Customers. First up, MyBiz defines a domain class that derives from an existing class and adds any properties that MyBiz wants to track. MyBiz also needs to modify their Customer Stalker database to include the new column – we’ll look at using Code First Migrations to do this in Part 2 (coming soon). By default Code First uses the TPH pattern to store an inheritance hierarchy, hence the new Discriminator column in the Customers table. This allows Entity Framework to differentiate between Customers and MyBizCustomers. 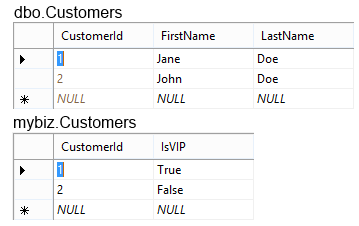 Later in this post we’ll take a look at how to introduce a derived type without modifying the existing table. Now MyBiz can use the hooks provided by Customer Stalker to add their new type to the model. Then they can insert MyBizCustomers using the Customer Stalker library. When MyBiz runs the above code, they’ll see the following data in the Customers table in their database. As expected, MyBiz can use the hooks to register their own derived type with extended properties and persist it to the database. One limitation of our solution thus far is that QuickAddCustomer doesn’t reason about the derived MyBizCustomer type and is just creating an instance of the base Customer type. This may not be ideal, because MyBiz may want all customers to have their extended properties, including those created internally by Customer Stalker. The Customer Stalker team is adding a RegisterTypeSubstitution method which allows a business to register a derived type to be used in place of a type from the base Customer Stalker model. There is also a Create method that internal Customer Stalker code can use to create types based on what substitutions have been applied. The QuickAddCustomer method is then updated to take type substitution into account. MyBiz adds in a call to RegisterTypeSubstitution to their test code to register the MyBizCustomer to be used in place of Customer. And now Customer Stalker is able to create instances of the custom derived type so that all instances include the extended properties. 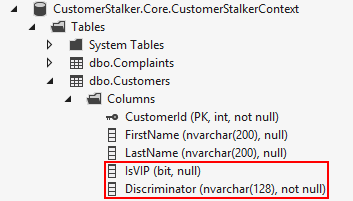 So far, the extra properties defined on a derived type have been stored in the core table that is created by Customer Stalker. In some scenarios this may not be acceptable. 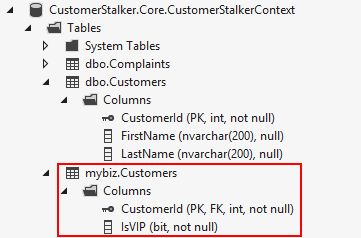 For example, Customer Stalker may not provide MyBiz with support for their product if they modify the core tables. Fortunately Code First supports the TPT inheritance mapping pattern, which allows us to store the extended properties from a derived type in a separate table. We don’t need any additional hooks in the Customer Stalker library, just some different configuration when MyBiz customizes the model. This new configuration will put all the extended properties of MyBizCustomer in a Customers table in the mybiz schema. Here is what the modified database should look like. Notice that the extended tables primary key is also a foreign key that points to the row in the core table. When MyBiz runs their test code here is what gets inserted into the database. In addition to adding and configuring new types, the model customization hook allows MyBiz to customize the tables/columns of the core Customer Stalker model. For example, MyBiz may operate in a part of the world where people have very long names. The maximum length of 200 that Customer Stalker configures for first and last name may not be enough. The following code allows MyBiz to override this with a maximum length of 400. Remember that MyBiz would also need to make this change to the database schema. In Part 2 (coming soon) we’ll look at allowing MyBiz to make this change with Code First Migrations.